The Domina kitchen is all about curves. Individuals with curved elements in their architecture might seek to replicate the expression of the building by having a contoured kitchen, or else one might find the converging surfaces without any sharp edges friendlier to work at. Curving kitchens are ergonomically smart, putting everything within reach. We can design maximum work surfaces in a minimum footprint, thus maximising the use of smallest of spaces. As with all Aster kitchen models, the elements are modular enabling us to create designs to fit any room size. 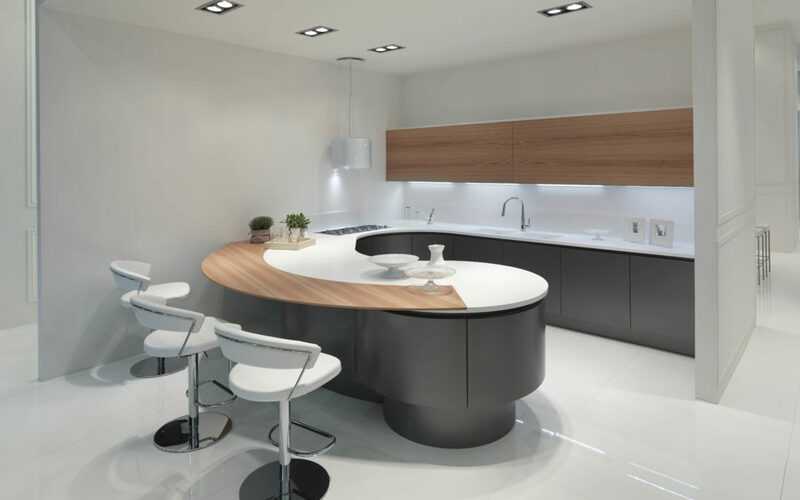 Curved kitchens can go from just a hint of a curve- for example at the end of base or tall units to a fully-fledged circular island or snaking peninsula (space-permitting). The curve in the fronts is achieved through extensive use of plywood; hence the value of such a curved kitchen is higher when compared to ones made from MDF or compressed wood. Curving modules including a carcass are even more so because not just the door is in plywood- rather the entire carcass. Available in a myriad of finishes including veneers and lacquers & with a handle or without, the possibilities are nearly endless. See some options at pages 02-60 of inside moderno catalogue. Speak to one of our design consultants to discover the possibilities for your space.